Firouzabadi added that there are positive points in JCPOA, but he did not want the agreement become a binding commitment by Iran through parliamentary approval. I didn't interpret the general's position for Parliament to formally vote no on JCPOA. There is a point of contention in Iran over JCPOA, on whether Parliament is required to pass a bill to support it, Elements of the Iran nuclear team assert that since the agreement is neither a treaty or convention, Parliament is not required for formal approval. Firouzabadi may actually be straddling the positions, and his position may not be that Parliament should vote no, against JCPOA. The rendering in Persian at Tasnim does not explicitly state Firouzabadi's position being parliament should vote no, while the PressTV rendering in English (as well as all Western MSM sources describe the general's support for the agreement. The general indeed said there are a number of positive provisions in the agreement dealing with the Iran's nuclear program, as reported in the post above, but he expresses serious concerns on defense-related issues contained in the accord, and does not want the see a Majlis approval of the agreement make those provisions legally binding. He could not be clearer than that. (Limitations on arms import/export and ballistic missile program for the next five and eight years respectively are among the defense-related clauses within JCPOA). The general's life depends on Khamenei's every breath. I couldn't fins the Fars article in Persian so I relied on the Tasnim article. If you could provide the link to the Fars article I'd be appreciative. The foreign ministry is also stating that non-binding aspects to ballistic missiles as directly applicable to the nuclear issue. The reason I'm interested in the Fars rendering in Persian is that all the other news coverage in English states the general supports JCPOA (including Fox) and that includes Press TV. It will be interesting to see how this plays out in both the Iranian and American legislatures. I didn't save the link, but when I get a chance I'll search the archives. The English translations you have read deal with the first part of his comments on nuclear program, generally positive and supportive of the provisions in the agreement. The second part deals with defense-related provisions, and that's where he says he didn't want the Majlis to make them into binding commitments for Iran and subject to misinterpretation by the U.S. by voting to approve the agreement. My take is he probably prefers that Majlis do not vote on the agreement. As matter of fact other influential voices inside Iran have said Majlis's approval is not necessary, as this is not a treaty, and they mention the 1988 agreement to end the war with Iraq that did not go through Majlis approval. By not voting, this will be an agreement between governments that could probably be reversed by a future government. Nader/ Mark it is obvious this fat 'general' is reveling in the huge surrender of the U.S. These guys are now gloating over this entire Iran nuke deal circus. They know they hold the upper hand, and with it a hugely ascendant Iran in the entire ME. If this wasn't true, the U.S. would have never negotiated with the mullahs. Looks like Iran has taken center stage in U.S. foreign policy, and must be pry'd away from Russia/ China and the dangerous Eurasian integration project of Putin and Xi. What Pepe Escobar and many others are alluding to in terms of Russian/ Chinese strategic ambitions and the role Iran plays in that scheme are sounding alarm bells in Washington. Obama knows this well and this non existent nuke threat posed by Iran concession (face saving) is a vindication of that fact, and a desperate attempt to woo Iran away from the two strategic competitors of the U.S. He is the head of General Staff, a military man, and yet weighs a ton; too much of a good thing does that to you. Regardless of how his words are interpreted, he is positioning himself and the interests that he represents to benefit from post-sanctions economic boom. He represents a mafia style business interest which has benefited enormously from sanctions and now they are changing track. I THINK HE WAS REBUKED BY SUPREME LEADER FOR HIM CONGRATULATING KHAMENEI FOLLOWING THE NUCLEAR DEAL . 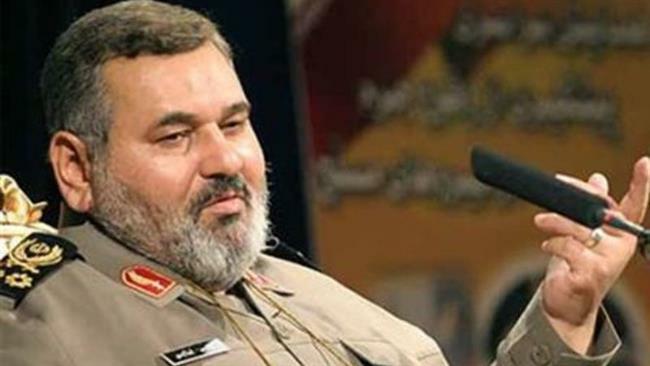 These fat generals are a disgrace to Iran. Stupid and ignorant PR to say the least, is a concept yet to be discovered over there. How embarrassing. "He is the head of General Staff, a military man,"
I hope you do realize that this man's only experience was as a animal veterinnarian? No real military training in his background. But a very close friend of the unelected religious dictator for life.With no real military experience and a "yes man" he is seen as no real threat to the islamic dictatorial establishment taken a stranglehold of the country. Across the entire spectrum they do exude an image of over bloated stupidity. Do you actually have any proof to back up that ridiculous assertion? If you didn't know that he was an animal veterinarian and has no real military experience then you have chosen to be misinformed.I suppose you also believe that Iran is a libral democracy and Khameini was elected into office? Go and do some research before you start accusing others of holding a ridiculous assertion.